Go CPAP - SHIPS FREE! Go Auto CPAP - SHIPS FREE! 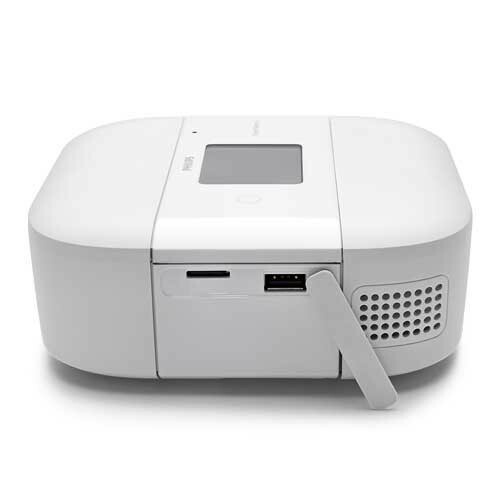 DreamStation Go provides continuous positive airway pressure to assist with breathing. Manufactured by Philips Respironics, DreamStation Go is a user-friendly respiratory aid for patients with sleep apnea. 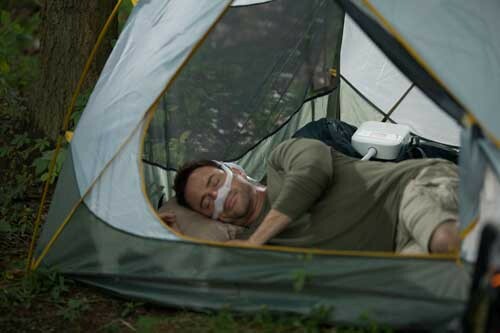 This sleep apnea device is available in two separate options. 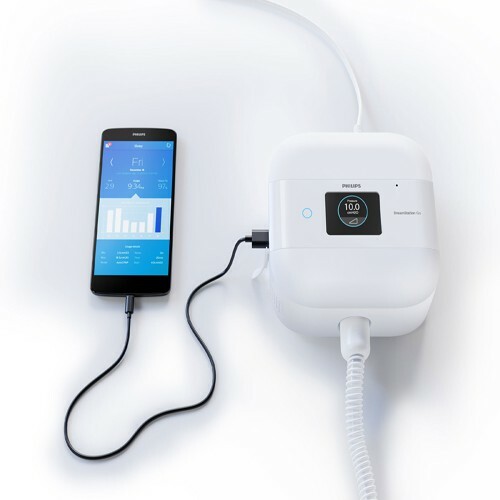 The Dreamstation Go Auto CPAP, commonly referred to as APAP, offering automatic pressure adjustment on a breath-by-breath basis. The other option is the Dreamstation Go CPAP device that supplies constant and steady air pressure. 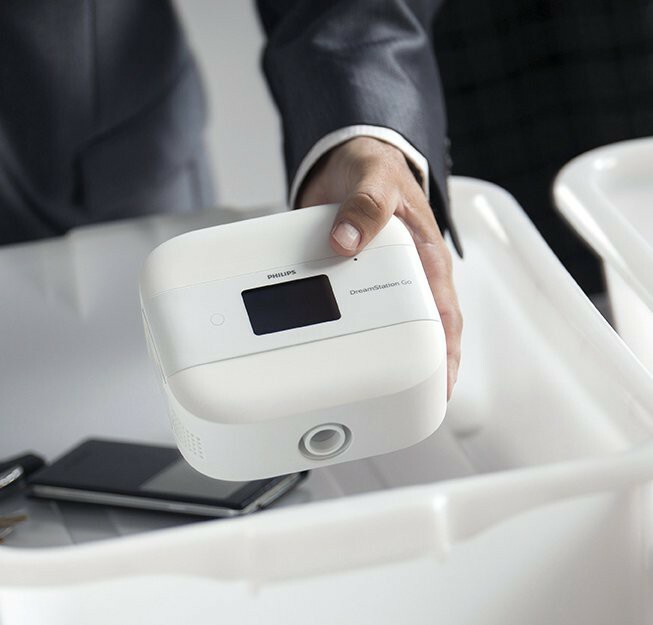 These portable PAP machines are small and lightweight for easy transport. They are designed with traveling patients in mind. Its compact design offers a slim profile weighing less than two pounds and is a slender and less bulky version of the original DreamStation. It has the same clinically-proven performance and reliable therapy for patients living with obstructive sleep apnea (OSA). Its minimal design means there's no need to forego a traveling lifestyle or sacrifice needed PAP therapy when you travel. It can even be used in-flight since it meets FAA standards. 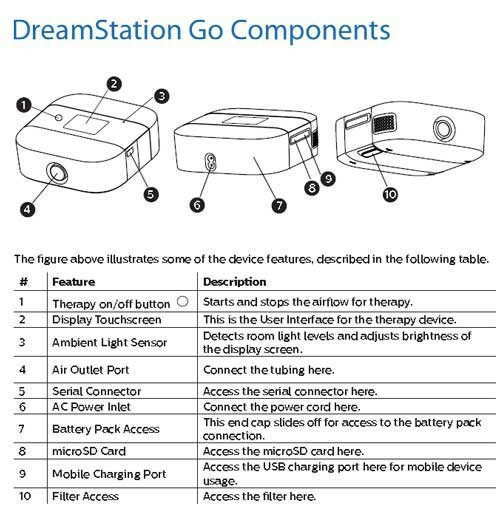 Dreamstation Go is designed to be a truly portable continuous positive airway pressure device. It is lightweight and has a small profile for easy transport. The system uses Philips' new and innovative 12mm micro-flexible tubing to continue the minimalistic trend while improving comfortability and mobility. 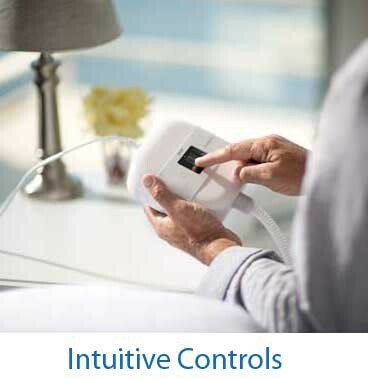 The device has a modern design with a simplified interface, such as a touchscreen, to access information, settings, and controls. 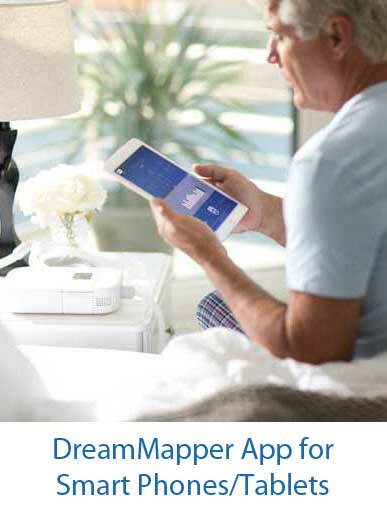 It has wireless Bluetooth connectivity to the DreamMapper app for users to receive important tips on how to stay on track with their therapy as well as receive daily progress reports. 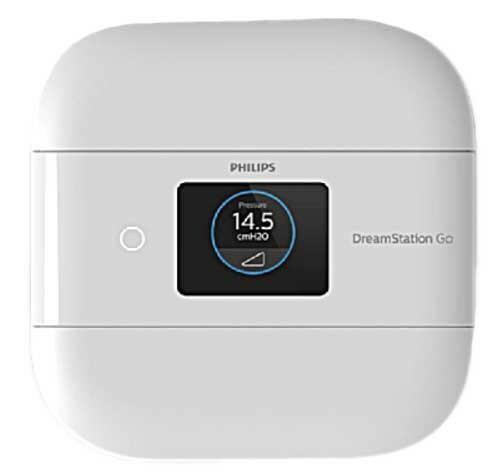 Any power source worldwide that offers 110 to 220 Volts can power the Philips Respironics Dreamstation Go sleep apnea treatment device. In some countries, a special adapter for the plug connection may be required. 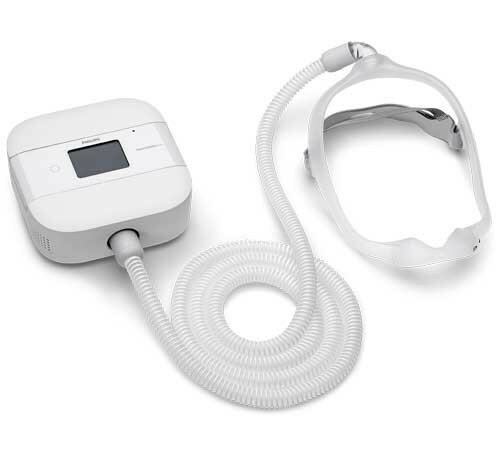 An optional rechargeable battery allows you to use this sleep apnea machine when no AC power source is available. With the battery, you can use it while on camping, fishing, or hiking trips. If the area you live in experiences frequent power outages, the battery option can get you through those dark nights. Its battery life of over 8 hours allows you to get a full-night's rest. The recharge time is less than five hours. A simplified touchscreen provides access to information, settings and controls. Two different filters are available. A washable, reusable filter for everyday use and an Ultra Fine filter. The washable filter should be rinsed every 2-weeks and replaced every 6-months. The Ultra Fine filter should be replaced monthly and should not be washed or rinsed. Two different size travel cases are available to protect the continuous positive airway pressure machine while traveling--Small Travel Kit and the Medium Travel Kit. 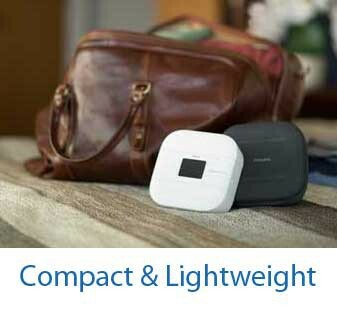 The Medium Travel Kit accommodates the sleep machine with its battery while the Small Travel Kit accommodates just the sleep machine itself. Both kits also include a carry bag for the hose and mask. 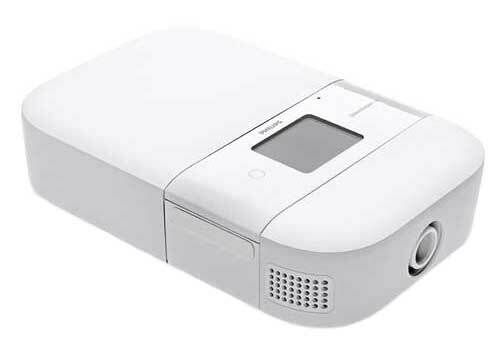 Other CPAP devices manufactured by Respironics includes the REMstar SE and the REMstar Plus. 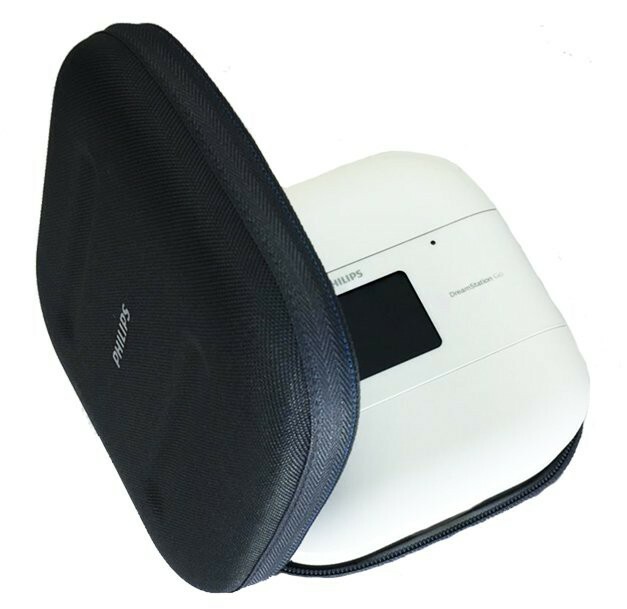 Portable CPAP or APAP you can travel with. Half the size of standard continuous positive airway pressure devices. Wirelessly connects to DreamMapper App. Offers daily progress report with 3 day comparison. Easier airport screening when traveling. Compatible with most full face, nasal and pillow masks*. Gives you the freedom to choose the mask you want*. 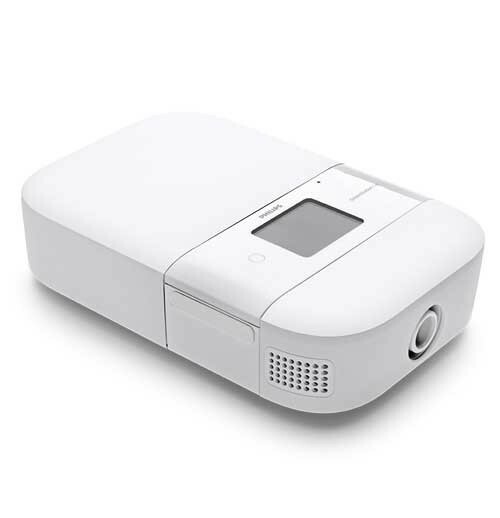 Only travel PAP with a USB chariging port†. Only travel PAP with a 12 mm hose†. *Disclaimer: Masks with standard 22mm outer diameter connection. Brochure offers features and benefits. Troubleshooting Guide offers procedures to correct common issues. FAQ's contains answers to frequently asked questions. A humidifier is not available with this unit.